Ok, so here are my Pulled Pork Sliders. And I made them with a zingy, fresh slaw. The pork has a bit of bite so the coleslaw just acts as a nice refresher. And since the yoghurt replaces the mayonnaise, it is super healthy! I was also going to spread a bit of mustard on the buns, but as I just mentioned, the pork already gave the burgers enough heat, so it was unnecessary in my opinion. As you can see, I used brioche buns, but please feel free to use whatever mini buns you wish. Oh and in case you are wondering, the recipe for the pulled pork itself is on another post of mine which I will link at the bottom of this page. By the way, did you notice the granite surface in these pictures? My dad built a bench to put that surface on and it has been a huge help in our kitchen. Especially when it comes to rolling dough and making pastry. So you will see many more photos on this bench in the future. Ok, that is enough rambling from me, as want to keep this post short and sweet. 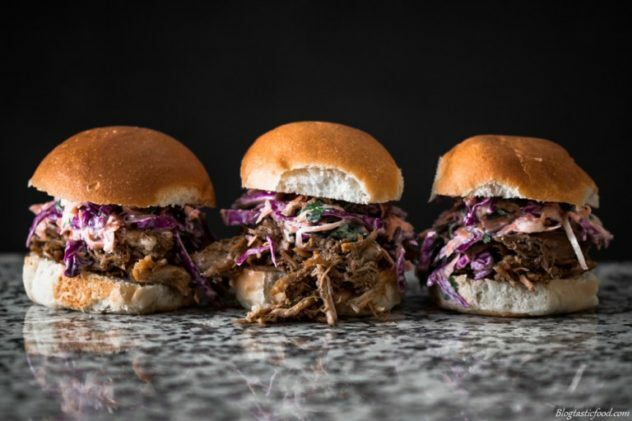 And remember, if you want to make these pulled pork sliders, make sure you check out the recipe for the pulled pork in the link below. Have an awesome day and I will send another recipe your way soon. 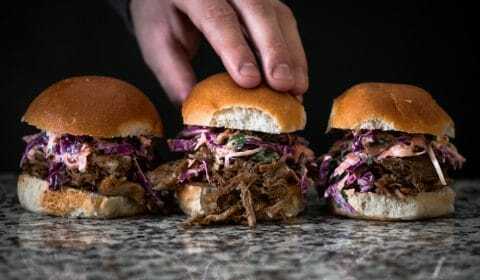 Simple pulled pork sliders that are also filled with an awesome and healthy lemon and yoghurt slaw. Mix the purple cabbage, grated carrot, onion, lemon juice, coriander, yogurt and a pinch of salt and pepper in a large bowl. 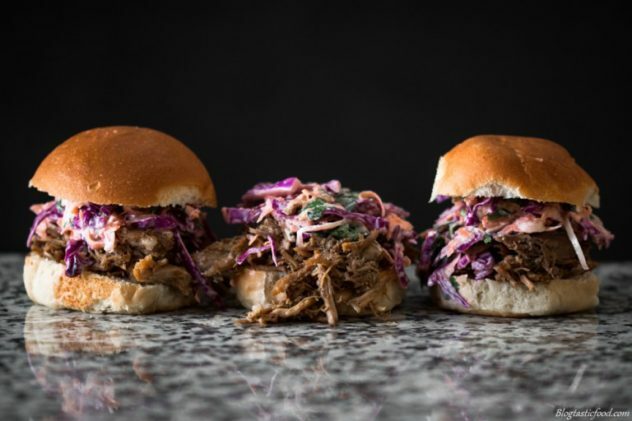 Start heating up your pulled pork if need be. Meanwhile, separate your buns with a knife. 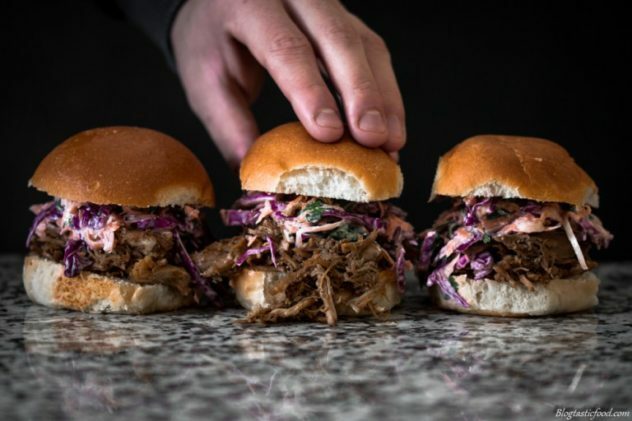 Fill your sliders with a generous amount of pulled pork and a nice big dollop of the slaw. Remember you have to make the pulled pork first. So make sure time is one your side before preparing this recipe. And don't forget that the link to the pulled pork recipe is down bellow. These are beautiful! 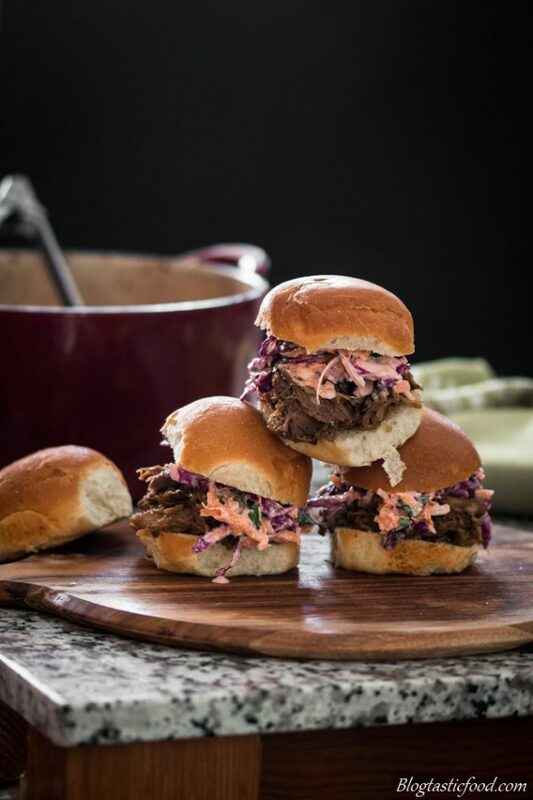 I love a creamy slaw with pulled pork. It’s a magical combination! Pretty photos! I love the look of those sliders. These look super Nick!! What fun to have a platter full with watermelon and something icy to drink on a hot summer night (that’s here now, not in Australia!). Love he idea of the slaw against the spiced pork. And like always, your photos are awesome! perfect Combo……pics are so inviting. Nice one. Wow! Glad I discover your page!